Man, when I started this post I was only going to tell you about two rad ladies, but it seems that Arthur and Fred Burley employed lots of women in leadership roles that let them, if you will pardon another one of my trademark corny puns, shape Australian public life. Clare Stevenson, by Nora Heysen, 1943. Clare Stevenson was born in Wangaratta, Victoria and raised in Essendon. She studied science at the University of Melbourne but graduated in education in 1925, and when WWII broke out she was a senior executive at Berlei in charge of corporate training and product development, travelling between London and Sydney and around Australia. "The interest in national fitness here amongst the older women will … help them keep the natural good posture and good looks of Australian youth till much later in life," Stevenson told the Perth Daily News in 1940, when she was visiting the city to deliver a very interesting-sounding lecture, 'The Care of the Bustline'. 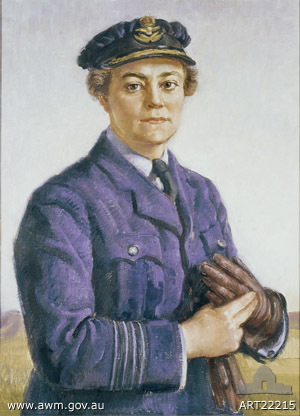 Due to her management and training experience (and also, apparently, because she wasn't a "socialite"), Stevenson was appointed the Director of the Women's Auxiliary Australian Air Force (WAAAF) in 1940, rising to the rank of Group Officer (the equivalent to Group Captain in the regular air force, or to a captain in the Royal Navy or general in the British Army) in 1942. The WAAAF was the first and the largest uniformed women's military service in Australia during WWII. By 1944 it had more than 18,000 members and made up roughly a third of the RAAF's ground force. A wonderful Sydney Morning Herald headline in 1941 marvelled, "Director of WAAAFs approves lipstick. Smokes, too." "Women look more attractive with lipstick, even in uniform," she said, accepting the reporter's offer of a cigarette. "Lacquered nails? It's largely a matter of taste." Seriously, though, she spent the war fighting for equal pay and respect for her enlistees, and against the sentiment from government authorities that women's best contribution to the war effort was to maintain the home. After the war, Stevenson returned to her previous job at Berlei. She retired in 1960. Never having married, she died in 1988, aged 85. The Sarong was advertised in the Australian Women's Weekly until the early 1980s. It featured two overlapping diagonal elastic panels in the front, which purportedly allowed more 'control' with greater freedom of movement. Early ads showed women dancing, walking a dog and playing golf in the garment. Another selling point was that it apparently didn't ride up. As a side note, when I see historical ads posted online, in blogs or on Pinterest and Tumblr, I often see people taking the imagery quite literally. As I write in the book, advertising is an archive of desire: it says much more about how people wanted to live than how they actually lived. This is valuable, because it's a way of capturing ephemeral social attitudes. You can tell what it might actually have been like to wear historical underwear by paying attention to what the ads say their products won't do, or that their competitors do badly. For instance, if an ad says, "Our corset bones are unbreakable!" you conclude that corset bones often used to break. Richardson also designed the luxurious Mink Bra. As its name suggests, it was a strapless long-line bra made out of fur, which retailed for 50 guineas in 1962 (around $650 in today's money). Check out a photo of this hilarious novelty garment here. "Unlike ordinary fashion designing," Richardson told the Australian Women's Weekly in 1961, "foundations have to be essentially practical and exact. The job's rather like accountancy and engineering with a dash of fashion thrown in." It was Fred Burley's idea to undertake a sizing survey, in partnership with the University of Sydney Medical School, which dovetailed perfectly with Berlei's pre-existing principles of scientifically precise fit and public showmanship. Public tents were set up on Bondi Beach over the summer of 1926-27, as well as at factories, seaside resorts and Turkish baths around Australia. Berlei's surveyors measured 6000 female volunteers aged between 15 and 65. Della Lytton Pratt was one of two undergraduate USyd science students recruited as research assistants. The students were in charge of collecting, classifying and correlating data from 23 different body measurements per participant, using specially designed calipers and rulers. The data revealed a strong relationship between hip and waist measurements. Working from this, in 1928 Pratt developed a diagram that became known as the Berlei Figure Type Indicator. This was a cardboard (and, later, plastic) chart designed for corsetières to help fit their customers. It featured a moveable disc printed with bust measurements, and a moveable pointer printed with waist measurements. The hip sizes were printed around the edge of the opening in the base. So, for instance, if your bust was 35 inches, waist was 28 inches and hips 37 inches (this is the example given in the patent description – I wonder if these were actually Della Pratt's own vital statistics), you'd spin the disc until the '35' printed on it aligned with the '37' printed around the edge. Then you'd slide the pointer so that the little notch on the end aligned with the same spot. 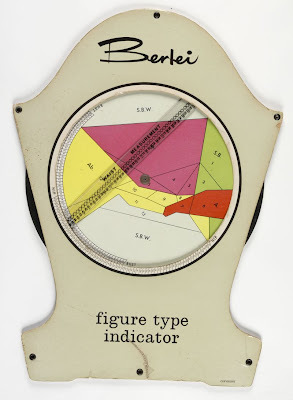 And you'd look through the little circular holes on the pointer (in later designs, the whole pointer was see-through) designating waist measurements, and whatever colour peeped through at '28' was the figure type Berlei reckoned you had. Here are the five colour-coded figure types, as displayed on a 1930s-era Indicator. I think I am Type Ab (Abdomen). Note that these types are all framed as things that are 'wrong' with a woman's body, that the corset can then step in and 'fix'. Della Lytton Pratt is listed as the owner of the patents for this device in Australia, New Zealand, South Africa, Great Britain, Canada and the US. Because Della was only 20 and so still a minor at the time, her dad, Major William Pratt of the Royal Australian Engineers, had to sign the deed of 'indenture' that transferred the rights to Della's invention to Berlei. 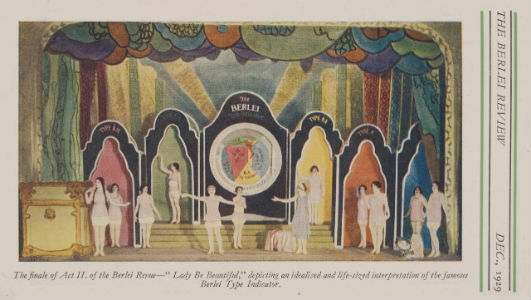 For her idea – from which Berlei went on to profit handsomely, and which figured prominently in the company's marketing – Della was paid five shillings. It's hard to figure out precisely how much that would be today. There are many ways of calculating historical value – the value of a commodity; of income or wealth; or the cost of a project. Many calculators work off the main currency unit at the time; the only specifically Australian historical value calculator I can find seems to work only in dollars. This gets tricky if your sources mention shillings, half-crowns and guineas. There were 12 pence to a shilling and 12 shillings to a pound. When Australia switched over to decimal currency in 1966, the conversion was two dollars to a pound, and ten shillings to a dollar. The Australian pound was introduced in 1910 and was roughly the same value as the UK pound sterling until 1931, so I used the UK values to figure out how much Della got paid. Anyway, Della's measly five shillings would have had the same purchasing power as about $18 today. When I was researching this stuff earlier in the year I became obsessed with finding out what became of Della Pratt after this. For someone who invented something so clever, she seems to have just given it up and gone on to lead a completely ordinary, unexceptional life. She graduated in 1928, and I tracked her through newspaper family notices as she married a Philip Oakley in 1930, and moved from Sydney to Gilmore, near Tumut in the NSW Riverina, and then – I think! – further west to Finley, near Deniliquin. Their first child, a daughter, was born in 1931. The Major died in 1932. :-( And from there, the trail goes cold and she vanishes into history. 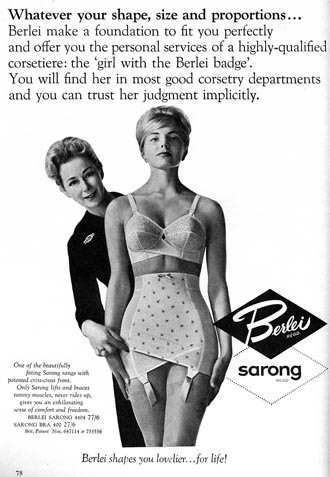 Australian lingerie label Berlei has its origins in a small made-to-measure Sydney corset company purchased by brothers Fred and Arthur Burley. Arthur came up with the idea of a Frenchified version of their surname to capitalise on the glamour of continental lingerie, and the company was renamed Berlei Limited in 1919 and incorporated in 1920. The company grew into a transnational empire with branch offices in Melbourne, Brisbane, Auckland, Adelaide and Perth. The Burleys believed strongly in scientific fitting principles. They ran annual training seminars for corsetry fitters, and between 1923 and 1926 they employed as Berlei's medical director Dr Grace Fairley Boelke. I'm not sure if she was fairly bulky, but she was intellectually brilliant; in 1893 she was one of Sydney Medical School's first two female graduates. In her youth she was also a total babe, with dark hair and striking blue eyes. But her early career suffered due to prejudice against female doctors, and anti-German sentiment during WWI, since she had married a German-born fellow medical graduate, Paul Wilhelm Rudolph Boelke. Boelke was active in women's suffrage organisations, and in public health policy. She believed alcoholism was a social equity and mental health issue, not a moral failing. In 1919 she presented a research paper on the history and effects of alcohol consumption, noting that French soldiers in Gallipoli were "well supplied with the light wines of their country" and suffered less from dysentery than the British. In 1924 she went to the United States to study the effects of its prohibition of alcohol. As the press reported, she came back "a rabid anti-prohibitionist", determined "to save her country from such a curse"! Yet I was dispirited to discover that in 1928, Boelke was widely reported as saying the White Australia policy didn't go far enough! She insisted, "Australia will be swamped by the East if she doesn't speedily accept a complete European civilisation." At this time she was living in London, and hopefully not mixing with Oswald Mosley, Diana Mitford and the other British fascists. Her job at Berlei was partly an OH&S role – she was responsible for the health and welfare of Berlei's 600 (mainly female) employees. On her 1924 US tour she also visited eight factories to observe their workplace safety practices. But she was also a public face for the pseudo-medical claims the Burleys made for their products. Part of her job was to ensure Berlei's corsets were "anatomically correct". I suspect that she just took their money and said, "Oh, yes, very correct." In a 1924 lecture on "The Philosophy of Clothes", Boelke said: "If women become slaves to fashion, then it should not be at the cost of health. Men are such 'timid animals', however, that they refuse to see the hygienic value of dressing for their comfort, and stick to high, stiff collars, wearing suits that hold dust and germs." What a fascinating reversal of the widespread belief that in the past, women were the ones suffering in their stiff, formal clothes! In the company's trade journal, Berlei Review, the brothers urged willowy flappers to "corset for the future" in order to prevent irreparable damage to "muscles and vital organs", or "excessive figure development in the middle years". This use of corsetry to train, rather than constrain, the female body would have been familiar to women whose mothers and grandmothers had encouraged them to cultivate their figures by corseting early and often. However, by the 1920s corsets were already past their heyday. Since at least the 1890s, a growing cultural shift encouraged people to sculpt their bodies from the inside, via diet and exercise, rather than from outside by squeezing them with corsetry. 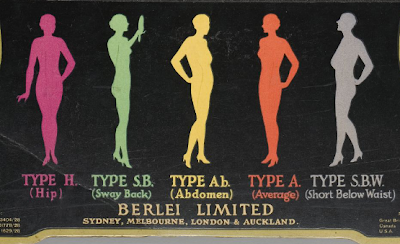 It was a tricky time for Berlei, whose 1920s marketing did reflect the prevailing cultural worship of youthful, sporty silhouettes. Its products had dainty, diminutive product names such as "Corselette" corsets and "Berlette" bras. The implied athleticism of its wrap-on "Dance Girdle" was continued in the annual touring musical revues Berlei staged in theatres and department stores to promote its merchandise; the 1924 revue was titled Youth Triumphant. In charge of these spectacles was another rad lady: Mary Craven. Her father owned an undergarment factory, which Mary managed before joining Unique Corsets – the company that would become Berlei – in 1915, as a designer. As part of Berlei's corporate strategy, Mary was regularly sent overseas on study tours to learn the most up-to-date industry trends. She then returned to art-direct and compere the annual revues, which were probably much like today's runway shows in the visually spectacular way they presented clothes, but at the time were absolutely novel. The stage setting was attractive and beautiful. The four acts Happiness, Hope, Health, and Triumph symbolised youth, the possibilities of attaining a beautiful figure for the maturer woman; corsetry after surgical treatment; and the importance of correct foundation garments to successful dressing. Each act was supported by a ballet and orchestra. Miss Mary Craven spoke briefly on the features of each model as it was shown. Interviewed by the Brisbane Courier in 1925, Craven said, "Only the woman who has a perfect digestion, never eats a scrap more food than she actually requires, and takes any amount of exercise can afford to discard corsets, and their absence mars the effect of even the best cut and most garçon-like gown. There was a period, after the war, when there was a craze for no corsets, but the well-dressed woman of to-day realises that they are a necessity."